Diabetes mellitus is a disease that causes higher than normal blood sugars in its sufferers. It is of two types: (1) Type I diabetes, which normally affects young people. It occurs when the body doesn't make enough insulin to rid the body of excess sugar. The only way to treat that disease is to provide insulin to make up for the lost insulin from the pancreas. (2) Type II diabetes generally affects older people and is a condition where the body makes insulin but the cells of the body don't respond to the insulin in the body. The disease of diabetes mellitus affects 20.8 million people in the US or 7% of the total population. Nearly 6 million of them do not know they have the disease. Both genetics and environment and heredity play a role in who gets diabetes and who doesn't. Poor dietary habits and obesity play a large role in the development of type II diabetes. There are many people who don't have diabetes mellitus but who are suffering from prediabetes, also sometimes called insulin resistance. Their body doesn't respond well to the insulin made by the pancreas but the situation isn't bad enough to raise the blood sugar levels yet. The body has higher than normal amounts of insulin in the system but it is enough to compensate for the blood sugar. Eventually, however, many prediabetics go on to develop diabetes in a few years. There are several tests for diabetes mellitus. The first is a fasting blood sugar. This is normally less than 100 mg per deciliter. In prediabetes, the number is often between 100 and 120 mg per deciliter. In diabetics, the number is often above 120 milligrams per deciliter and is often much higher than that. The other test for diabetes mellitus is called the "three hour glucose tolerance test" or "3 hr GTT". This involves getting a fasting blood sugar and then giving the individual a small bottle of highly sugared liquid to drink. Then the blood sugar is tested at one hour, two hours and three hours after drinking the sugared liquid. If any number is above 200, then diabetes is diagnosed. Another test for diabetes mellitus is to check the glycosylated hemoglobin level. This is a measure of the amount of "sugar coated" blood cells in the body. The normal level is 6.0 and numbers above that is felt to be diabetes. The treatment for diabetes mellitus is different depending on the type of diabetes the person has. Type I diabetes is almost always treated by insulin shots. This is because there is no insulin being put out by the pancreas and so insulin must be replaced. Type II diabetes is often treated with diet and medications. The medications are those that make the cells of the body respond better to the insulin being provided by the pancreas. There are also medications that act to lower the blood sugar directly. 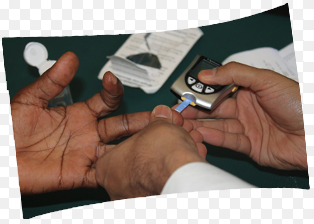 Those with diabetes mellitus must check their blood sugars frequently with a glucometer or blood glucose meter. This may need to be done as often as six or more times per day for type I diabetes and the values reached determine the amount of insulin the person needs per dose. Insulin shots are given before each meal and sometimes at bedtime. Type II diabetics don't often need to check their blood sugars that often. Sometimes it is just checked in the morning and then after the evening meal.